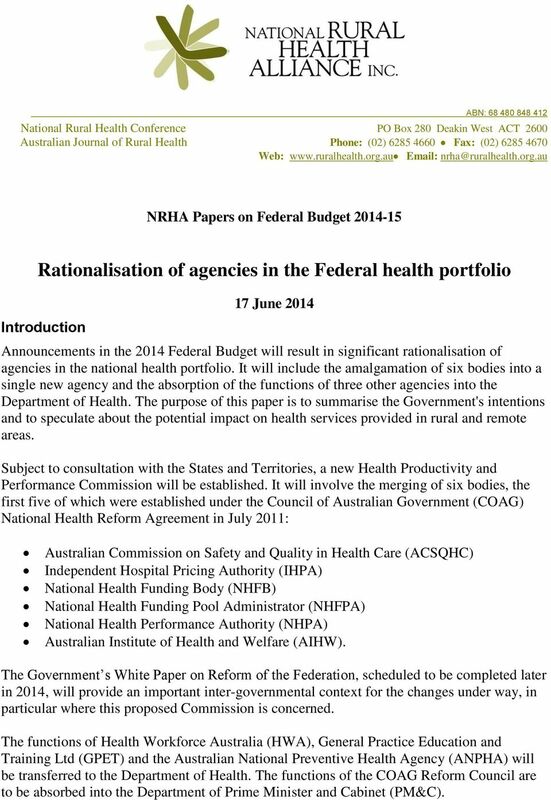 Download "Rationalisation of agencies in the Federal health portfolio"
1 ABN: National Rural Health Conference PO Box 280 Deakin West ACT 2600 Australian Journal of Rural Health Phone: (02) Fax: (02) Web: NRHA Papers on Federal Budget Rationalisation of agencies in the Federal health portfolio Introduction 17 June 2014 Announcements in the 2014 Federal Budget will result in significant rationalisation of agencies in the national health portfolio. It will include the amalgamation of six bodies into a single new agency and the absorption of the functions of three other agencies into the Department of Health. The purpose of this paper is to summarise the Government's intentions and to speculate about the potential impact on health services provided in rural and remote areas. Subject to consultation with the States and Territories, a new Health Productivity and Performance Commission will be established. It will involve the merging of six bodies, the first five of which were established under the Council of Australian Government (COAG) National Health Reform Agreement in July 2011: Australian Commission on Safety and Quality in Health Care (ACSQHC) Independent Hospital Pricing Authority (IHPA) National Health Funding Body (NHFB) National Health Funding Pool Administrator (NHFPA) National Health Performance Authority (NHPA) Australian Institute of Health and Welfare (AIHW). The Government s White Paper on Reform of the Federation, scheduled to be completed later in 2014, will provide an important inter-governmental context for the changes under way, in particular where this proposed Commission is concerned. The functions of Health Workforce Australia (HWA), General Practice Education and Training Ltd (GPET) and the Australian National Preventive Health Agency (ANPHA) will be transferred to the Department of Health. The functions of the COAG Reform Council are to be absorbed into the Department of Prime Minister and Cabinet (PM&C). 3 3 The Minister for Health has said that HWA created another layer in the health bureaucracy which was taking valuable resources away from frontline health services, and that HWA and the Department of Health both manage health workforce programs. 3 Regarding ANPHA, the Minister noted a lack of clear demarcation of responsibilities between ANPHA and the Department of Health, leading to a fragmented approach to preventive health and inefficiencies through duplication of administrative, policy and program functions between ANPHA and the Department, with additional staffing and administrative costs required to run ANPHA for functions that can be effectively performed by the Health Department. 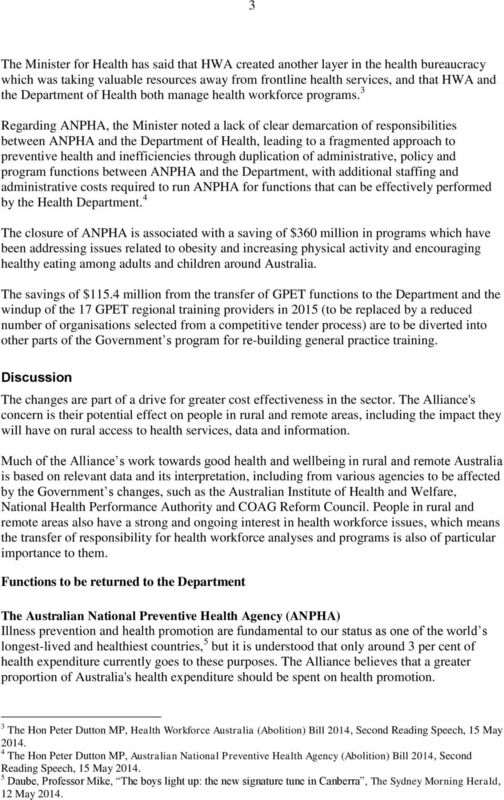 4 The closure of ANPHA is associated with a saving of $360 million in programs which have been addressing issues related to obesity and increasing physical activity and encouraging healthy eating among adults and children around Australia. 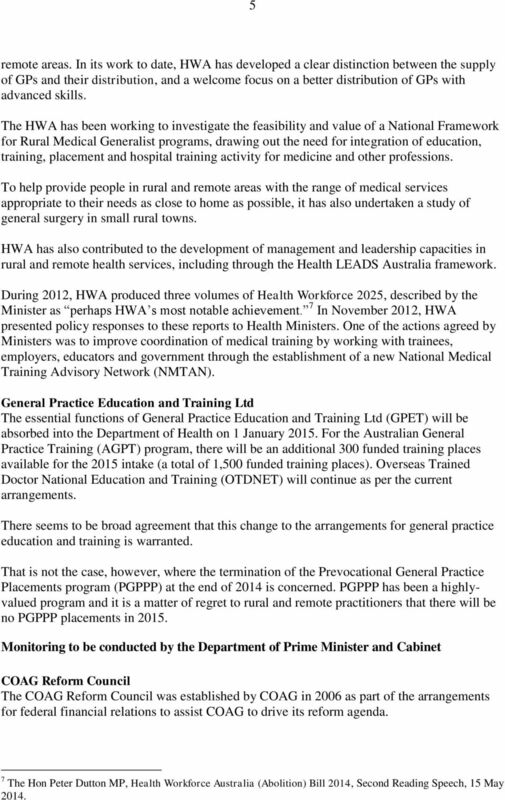 The savings of $115.4 million from the transfer of GPET functions to the Department and the windup of the 17 GPET regional training providers in 2015 (to be replaced by a reduced number of organisations selected from a competitive tender process) are to be diverted into other parts of the Government s program for re-building general practice training. Discussion The changes are part of a drive for greater cost effectiveness in the sector. The Alliance's concern is their potential effect on people in rural and remote areas, including the impact they will have on rural access to health services, data and information. Much of the Alliance s work towards good health and wellbeing in rural and remote Australia is based on relevant data and its interpretation, including from various agencies to be affected by the Government s changes, such as the Australian Institute of Health and Welfare, National Health Performance Authority and COAG Reform Council. People in rural and remote areas also have a strong and ongoing interest in health workforce issues, which means the transfer of responsibility for health workforce analyses and programs is also of particular importance to them. Functions to be returned to the Department The Australian National Preventive Health Agency (ANPHA) Illness prevention and health promotion are fundamental to our status as one of the world s longest-lived and healthiest countries, 5 but it is understood that only around 3 per cent of health expenditure currently goes to these purposes. The Alliance believes that a greater proportion of Australia's health expenditure should be spent on health promotion. 3 The Hon Peter Dutton MP, Health Workforce Australia (Abolition) Bill 2014, Second Reading Speech, 15 May The Hon Peter Dutton MP, Australian National Preventive Health Agency (Abolition) Bill 2014, Second Reading Speech, 15 May Daube, Professor Mike, The boys light up: the new signature tune in Canberra, The Sydney Morning Herald, 12 May 2014. 4 4 Not only should the national effort be greater, but there should be urgent action to understand how illness prevention work can be made more effective for rural areas. It is a matter of great concern that public health campaigns in relation to smoking have clearly not been as effective in rural and remote areas as in the major cities. With its enhanced responsibility for preventive health, the Department should investigate the reasons for this and apply to health promotion more broadly the lessons learned relating to such campaigns and messaging in rural and remote areas. ANPHA began valuable work to address health concerns relating to obesity and a lifestyle risk factor approach to chronic conditions. The Department will understand that, where health promotion is concerned, sustained effort is one of the keys to success. The experience with skin cancer prevention campaigns, for example, has shown that benefits can take many years to come to fruition. 6 It is to be hoped that the changes in administrative arrangements will enhance the provision of policy advice and health promotion activities for rural and remote communities. Health Workforce Australia The Alliance has had a good working relationship with Health Workforce Australia (HWA) and been involved with many of its projects. In consultation with interested bodies, including the Alliance, HWA developed the Strategic Framework for National Health Workforce Innovation and Reform and the Rural and Remote Health Workforce Innovation and Reform Strategy. These framework documents, and the implementation projects related to them, provide a valuable focus on action for a more sustainable and better distributed health workforce. Staff of HWA have consistently demonstrated their understanding of the need for a collaborative multidisciplinary approach to health workforce issues, and the importance of a clear understanding of the particular needs of health services in rural, regional and remote areas. Its work has been premised on the view that workforce design and planning needs to work backwards from outcomes for communities and consumers and population need. The Alliance has made the point that workforce measures should deal first with the most serious shortages, based on the principle of equity of access. The way forward should include progressing workforce redesign, including by enabling existing professionals to function to their full capacity within their competencies. Current issues relating to physician assistants illustrate the way in which innovation can be stalled if the health and education sectors are not united and in agreement on issues such as education and training, regulation, scopes of practice and the funding of positions. HWA's project on Rural and Remote Generalist Allied Health Professions is of great interest to the Alliance, as is the Health Professionals Prescribing Project. Part of the rationale for the latter is the limited access to medical practitioners who can prescribe medications in rural and 6 House of Representatives Standing Committee on Health and Ageing (2013), Roundtable on Skin Cancer, 21 June 2013, Hansard, p7, Professor John Thompson. 5 5 remote areas. In its work to date, HWA has developed a clear distinction between the supply of GPs and their distribution, and a welcome focus on a better distribution of GPs with advanced skills. The HWA has been working to investigate the feasibility and value of a National Framework for Rural Medical Generalist programs, drawing out the need for integration of education, training, placement and hospital training activity for medicine and other professions. To help provide people in rural and remote areas with the range of medical services appropriate to their needs as close to home as possible, it has also undertaken a study of general surgery in small rural towns. HWA has also contributed to the development of management and leadership capacities in rural and remote health services, including through the Health LEADS Australia framework. During 2012, HWA produced three volumes of Health Workforce 2025, described by the Minister as perhaps HWA s most notable achievement. 7 In November 2012, HWA presented policy responses to these reports to Health Ministers. One of the actions agreed by Ministers was to improve coordination of medical training by working with trainees, employers, educators and government through the establishment of a new National Medical Training Advisory Network (NMTAN). General Practice Education and Training Ltd The essential functions of General Practice Education and Training Ltd (GPET) will be absorbed into the Department of Health on 1 January For the Australian General Practice Training (AGPT) program, there will be an additional 300 funded training places available for the 2015 intake (a total of 1,500 funded training places). Overseas Trained Doctor National Education and Training (OTDNET) will continue as per the current arrangements. There seems to be broad agreement that this change to the arrangements for general practice education and training is warranted. That is not the case, however, where the termination of the Prevocational General Practice Placements program (PGPPP) at the end of 2014 is concerned. PGPPP has been a highlyvalued program and it is a matter of regret to rural and remote practitioners that there will be no PGPPP placements in Monitoring to be conducted by the Department of Prime Minister and Cabinet COAG Reform Council The COAG Reform Council was established by COAG in 2006 as part of the arrangements for federal financial relations to assist COAG to drive its reform agenda. 7 The Hon Peter Dutton MP, Health Workforce Australia (Abolition) Bill 2014, Second Reading Speech, 15 May 2014. 6 6 Independent of individual governments, it has reported directly to COAG on reforms of national significance that require cooperative action by Australian governments, including the National Health Reform Agreement of July The Reform Council s aims included achieving its mission through engagement with key stakeholders - governments, the public and federal system - to develop and maintain a culture of performance, accountability and innovation. The work of the Council has enabled governments, including the Commonwealth and the State and Territory jurisdictions, to monitor and improve their performance according to the COAG reform agenda, and has equipped the public with information to interpret performance and hold governments to account. 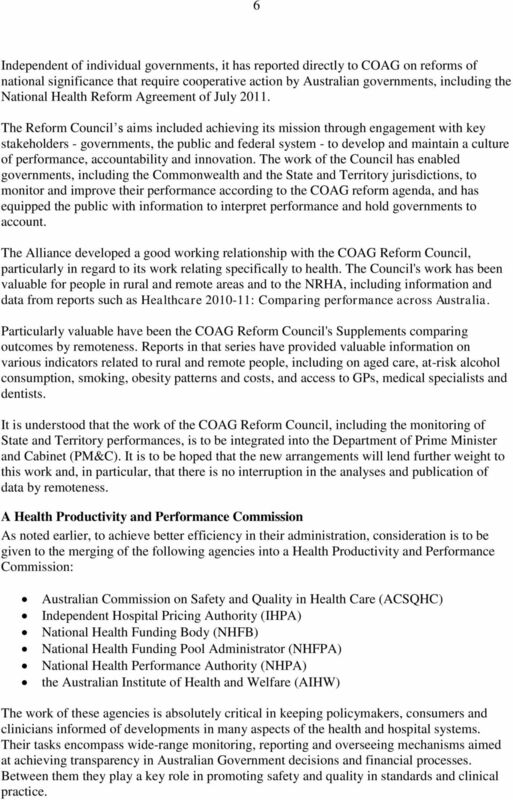 The Alliance developed a good working relationship with the COAG Reform Council, particularly in regard to its work relating specifically to health. The Council's work has been valuable for people in rural and remote areas and to the NRHA, including information and data from reports such as Healthcare : Comparing performance across Australia. Particularly valuable have been the COAG Reform Council's Supplements comparing outcomes by remoteness. Reports in that series have provided valuable information on various indicators related to rural and remote people, including on aged care, at-risk alcohol consumption, smoking, obesity patterns and costs, and access to GPs, medical specialists and dentists. It is understood that the work of the COAG Reform Council, including the monitoring of State and Territory performances, is to be integrated into the Department of Prime Minister and Cabinet (PM&C). It is to be hoped that the new arrangements will lend further weight to this work and, in particular, that there is no interruption in the analyses and publication of data by remoteness. 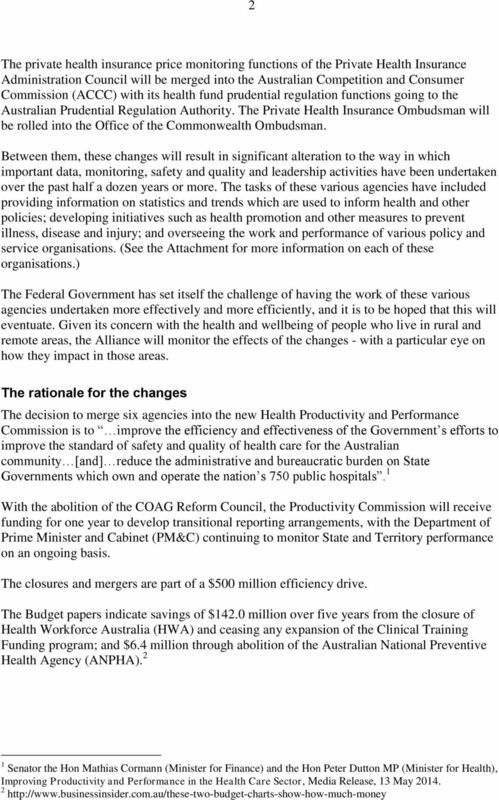 A Health Productivity and Performance Commission As noted earlier, to achieve better efficiency in their administration, consideration is to be given to the merging of the following agencies into a Health Productivity and Performance Commission: Australian Commission on Safety and Quality in Health Care (ACSQHC) Independent Hospital Pricing Authority (IHPA) National Health Funding Body (NHFB) National Health Funding Pool Administrator (NHFPA) National Health Performance Authority (NHPA) the Australian Institute of Health and Welfare (AIHW) The work of these agencies is absolutely critical in keeping policymakers, consumers and clinicians informed of developments in many aspects of the health and hospital systems. Their tasks encompass wide-range monitoring, reporting and overseeing mechanisms aimed at achieving transparency in Australian Government decisions and financial processes. Between them they play a key role in promoting safety and quality in standards and clinical practice. 7 7 The ACSQHC leads and coordinates improvements in safety and quality in health care and formulates policies and recommendations on priorities to be actioned. It briefs policy makers and health service managers about current evidence of effective interventions for patient safety, work flows and hospital costs. The work of the ACSQHC is highly regarded. In 2013, it received two Prime Minister s Awards for Excellence in Public Sector Management related to National Safety and Quality Health Standards and for projects entailing significant collaboration with other agencies. The tasks of the Independent Hospital Pricing Authority (IHPA) relate to national price efficiencies and transparencies for hospitals, including collating and publishing State and Territory data and information, examining particular funding models including the implementation of activity based funding and working to ensure increased efficiency and transparency in Australia s public hospital system. Of key interest to the Alliance is the important work it has done on block funding for small rural hospitals. 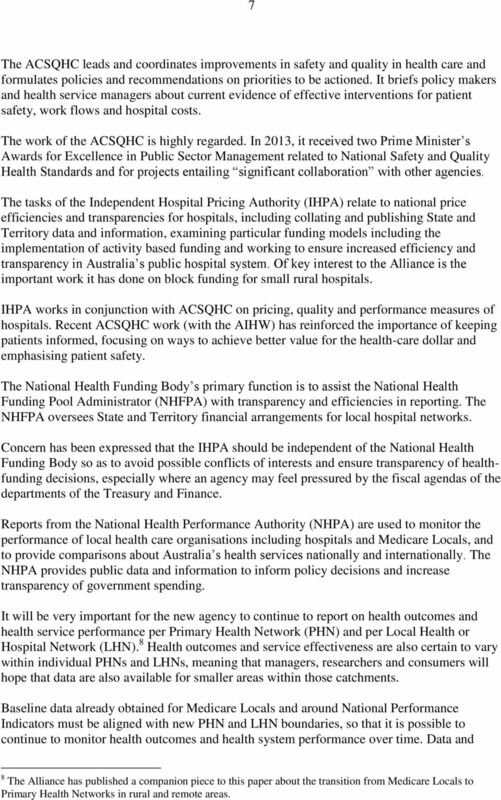 IHPA works in conjunction with ACSQHC on pricing, quality and performance measures of hospitals. Recent ACSQHC work (with the AIHW) has reinforced the importance of keeping patients informed, focusing on ways to achieve better value for the health-care dollar and emphasising patient safety. The National Health Funding Body s primary function is to assist the National Health Funding Pool Administrator (NHFPA) with transparency and efficiencies in reporting. The NHFPA oversees State and Territory financial arrangements for local hospital networks. Concern has been expressed that the IHPA should be independent of the National Health Funding Body so as to avoid possible conflicts of interests and ensure transparency of healthfunding decisions, especially where an agency may feel pressured by the fiscal agendas of the departments of the Treasury and Finance. Reports from the National Health Performance Authority (NHPA) are used to monitor the performance of local health care organisations including hospitals and Medicare Locals, and to provide comparisons about Australia s health services nationally and internationally. The NHPA provides public data and information to inform policy decisions and increase transparency of government spending. It will be very important for the new agency to continue to report on health outcomes and health service performance per Primary Health Network (PHN) and per Local Health or Hospital Network (LHN). 8 Health outcomes and service effectiveness are also certain to vary within individual PHNs and LHNs, meaning that managers, researchers and consumers will hope that data are also available for smaller areas within those catchments. Baseline data already obtained for Medicare Locals and around National Performance Indicators must be aligned with new PHN and LHN boundaries, so that it is possible to continue to monitor health outcomes and health system performance over time. Data and 8 The Alliance has published a companion piece to this paper about the transition from Medicare Locals to Primary Health Networks in rural and remote areas. 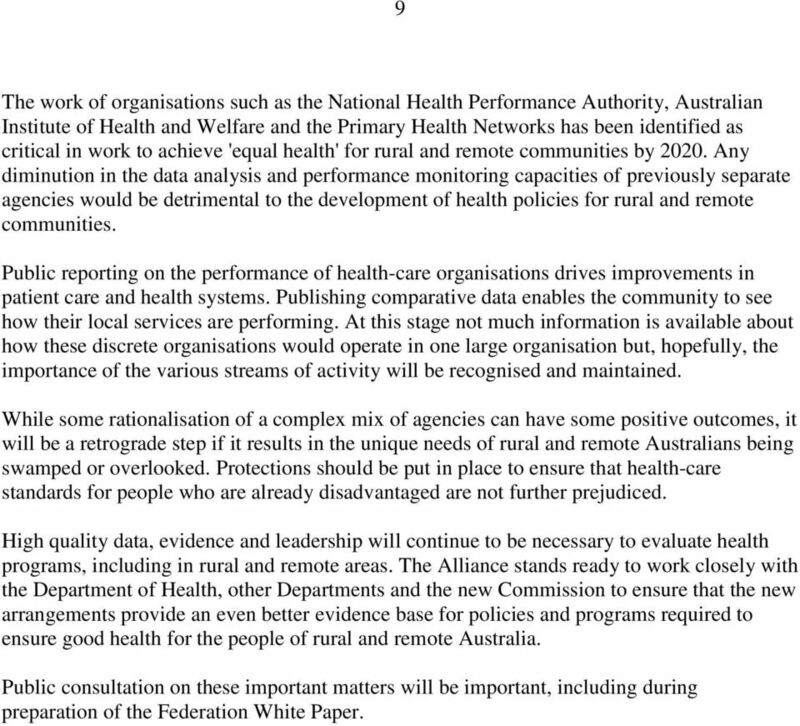 9 9 The work of organisations such as the National Health Performance Authority, Australian Institute of Health and Welfare and the Primary Health Networks has been identified as critical in work to achieve 'equal health' for rural and remote communities by Any diminution in the data analysis and performance monitoring capacities of previously separate agencies would be detrimental to the development of health policies for rural and remote communities. Public reporting on the performance of health-care organisations drives improvements in patient care and health systems. Publishing comparative data enables the community to see how their local services are performing. At this stage not much information is available about how these discrete organisations would operate in one large organisation but, hopefully, the importance of the various streams of activity will be recognised and maintained. While some rationalisation of a complex mix of agencies can have some positive outcomes, it will be a retrograde step if it results in the unique needs of rural and remote Australians being swamped or overlooked. Protections should be put in place to ensure that health-care standards for people who are already disadvantaged are not further prejudiced. High quality data, evidence and leadership will continue to be necessary to evaluate health programs, including in rural and remote areas. 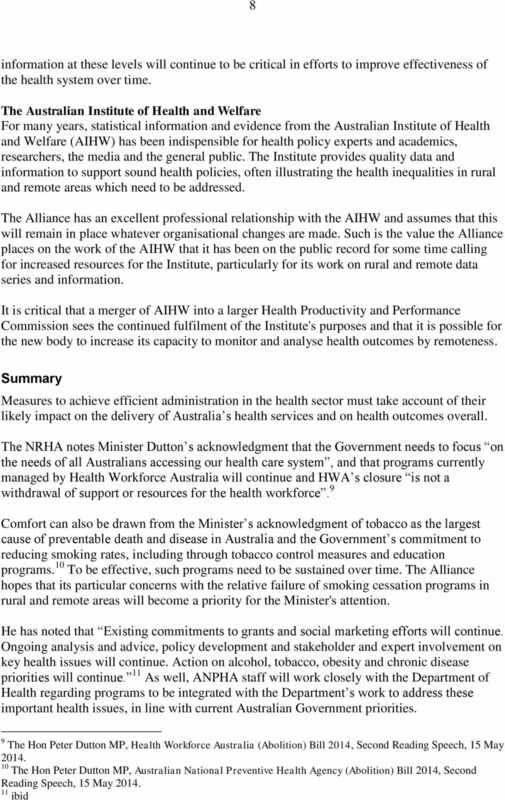 The Alliance stands ready to work closely with the Department of Health, other Departments and the new Commission to ensure that the new arrangements provide an even better evidence base for policies and programs required to ensure good health for the people of rural and remote Australia. Public consultation on these important matters will be important, including during preparation of the Federation White Paper. 10 10 Attachment Agency profiles Australian Commission on Safety and Quality in Health Care (ACSQHC). Formed in 2006 by the Government in partnership with the States and Territories, the Commission coordinates improvements and sets Australian standards for health-care safety and quality. Independent Hospital Pricing Authority (IHPA). Set up in 2011, the Authority s main role is to assist in calculating funding allocations to individual hospitals. National Health Funding Body (NHFB). Established in 2012, this body assists the National Health Funding Pool Administrator, enabling more transparent and efficient public hospital funding. 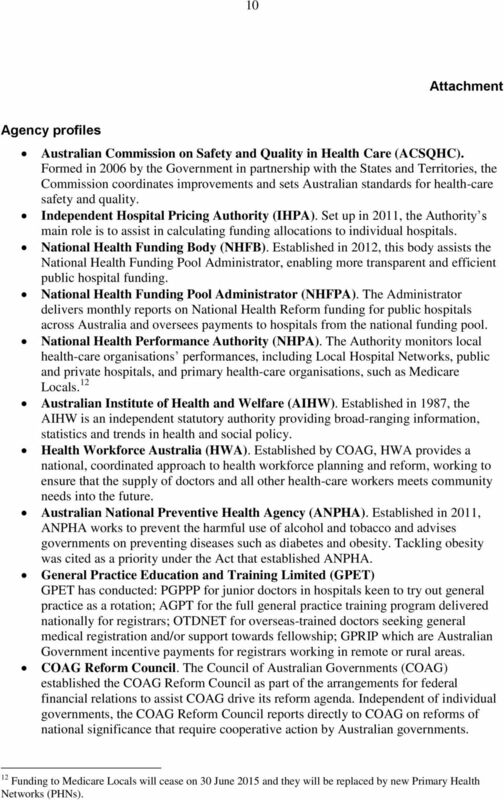 National Health Funding Pool Administrator (NHFPA). The Administrator delivers monthly reports on National Health Reform funding for public hospitals across Australia and oversees payments to hospitals from the national funding pool. National Health Performance Authority (NHPA). The Authority monitors local health-care organisations performances, including Local Hospital Networks, public and private hospitals, and primary health-care organisations, such as Medicare Locals. 12 Australian Institute of Health and Welfare (AIHW). Established in 1987, the AIHW is an independent statutory authority providing broad-ranging information, statistics and trends in health and social policy. 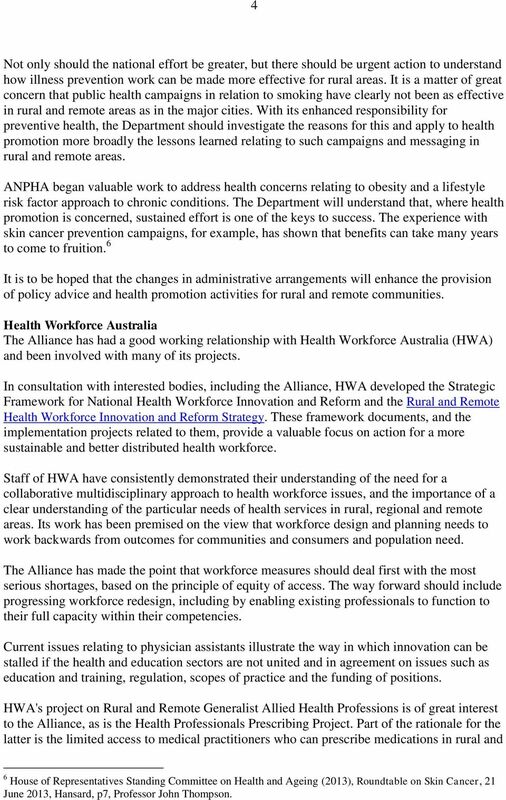 Health Workforce Australia (HWA). Established by COAG, HWA provides a national, coordinated approach to health workforce planning and reform, working to ensure that the supply of doctors and all other health-care workers meets community needs into the future. Australian National Preventive Health Agency (ANPHA). Established in 2011, ANPHA works to prevent the harmful use of alcohol and tobacco and advises governments on preventing diseases such as diabetes and obesity. Tackling obesity was cited as a priority under the Act that established ANPHA. General Practice Education and Training Limited (GPET) GPET has conducted: PGPPP for junior doctors in hospitals keen to try out general practice as a rotation; AGPT for the full general practice training program delivered nationally for registrars; OTDNET for overseas-trained doctors seeking general medical registration and/or support towards fellowship; GPRIP which are Australian Government incentive payments for registrars working in remote or rural areas. COAG Reform Council. The Council of Australian Governments (COAG) established the COAG Reform Council as part of the arrangements for federal financial relations to assist COAG drive its reform agenda. Independent of individual governments, the COAG Reform Council reports directly to COAG on reforms of national significance that require cooperative action by Australian governments. 12 Funding to Medicare Locals will cease on 30 June 2015 and they will be replaced by new Primary Health Networks (PHNs). Briefing for APHA Members - The National Commission of Audit Report, May 2014. Optometry Australia submission to the Commonwealth s Private Health insurance Consultations Optometry Australia welcomes the opportunity to input to the Commonwealth s review of Private Health Insurance. COOPERATIVE RESEARCH CENTRES PROGRAMME REVIEW Submission by November 2014 Page 1 ABOUT RESEARCH AUSTRALIA is an alliance of 160 members and supporters advocating for health and medical research in Australia. Surprisingly Australia is a civilized and developed country! We have universal health care (more or less)!